I'm a total Sondheim fan through and through and have been for as long as I can remember, so when news got out that Imelda Staunton (my favourite stage actress) and Janie Dee were to be starring in a lavish revival of Follies (arguably Sondheim's most stunning show) at the National Theatre (my favourite place on Earth), I'm sure you can imagine how my heart started to flutter at the thought. With a revival like this one - that I teased on Instagram I'd been waiting my entire life to see - it's always a worry of mine that it's not going to live up to expectations; when I have a very good idea of the show to start with, it's very easy to feel like you didn't connect with a new production of the show you love so well. That was the way when it came to the recent revival of The Last Five Years at The Other Palace (at the time known as the St James Theatre). However, much to my relief, Dominic Cooke has crafted a masterful production of one of the greatest musicals ever written that even a Sondheim fanatic like myself can get on board with. 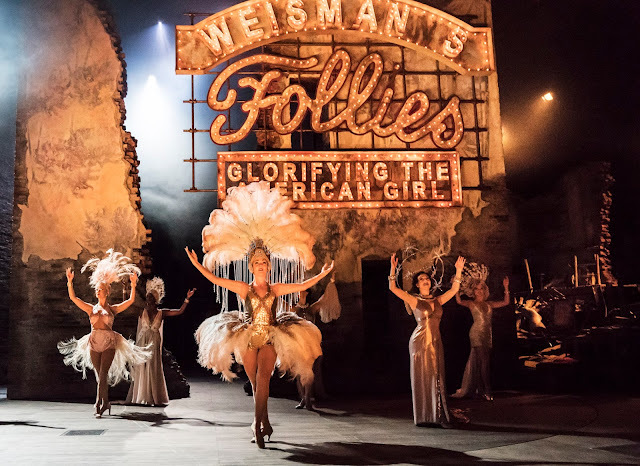 In fact, I'd go as far as to say that this production of Follies was so incredibly perfect that I felt like I was totally rediscovering the show all over again. For those who don't know the story of Sondheim's Follies, it tells the tale of a group of women who worked as dancers in the Follies in New York back in the day and, now in the early 1970s, have been invited back to their old theatre for one final party before its pulled down to make way for a new office block. At the party, we focus in on a lot of the ladies, but primarily Sally (Staunton) and Phyllis (Dee) and their husbands Buddy (Peter Forbes) and Ben (Philip Quast) respectively. We explore their troubled lives and relationships as a group of four friends through the eyes of their older selves and their younger selves who shadow them throughout the show, played by the likes of Alex Young (Young Sally), Zizi Strallen (Young Phyllis), Fred Haig (Young Buddy) and Adam Rhys-Charles (Young Ben). Of course, the source material is what needs crediting here more than absolutely anything else. 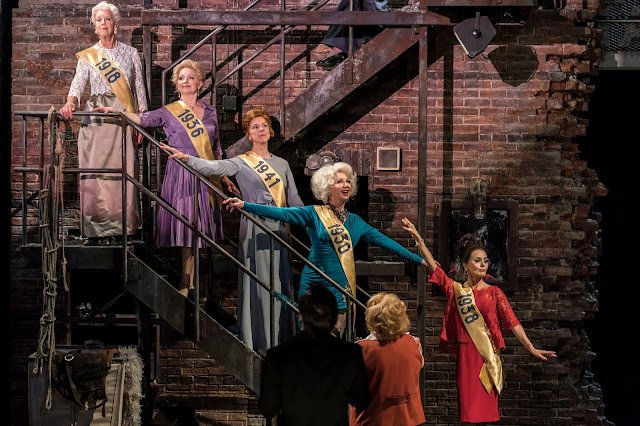 The original Broadway production of Follies was, surprisingly now in retrospect, widely regarded as a major flop after ultimately losing its entire investment and only running on Broadway for a little over 500 performances. This doesn't ever mean that a show is bad though and in this case, that could not be further from the truth. There are many elements of Sondheim's soaring and lavish score that are reminiscent of shows from the '20s and '30s (which was his intention) as well as some motifs feeling like a historical foreshadowing to then-future Sondheim hits (to me, Phyll's number 'Could I Leave You?' has many moments that remind me of 'Last Midnight' from Into The Woods). From the very first chords of the show's prologue, you know you are in for a musical treat and in true Sondheim fashion, this show is a fine example of how music and storytelling can be interwoven so expertly, you won't even notice that one song is ending and another is beginning. It's beyond incredible for that alone. As is the case with many revivals though, it always takes a fantastic cast to bring a show back to its former glory and Cooke has certainly managed to pull together a brilliant one. With multi-award-winning legend Imelda Staunton as the iconic Sally Durant, Janie Dee as Phyllis Rogers Stone, Tracie Bennett as Carlotta Champion, Philip Quast as Benjamin Stone, Di Botcher as Hattie Walker and so many more amazing people, this revival is star-studded if anything else. And while you may enter the theatre thinking that you're going to be blown away by Staunton's vocals or Dee's acting chops alone, as the show progresses, you discover so many more talents that you didn't even know these incredible performers had. I truly did believe before I went in that Staunton was going to be the one who left me speechless, but the moment Janie Dee started dancing in tandem with Zizi Strallen (who plays Young Phyllis) in 'The Story of Lucy and Jessie', I knew this cast was even more special that I could've ever imagined. This is one of those rare moments in theatrical history where an ensemble cast is completely jam-packed with stars and it is truly impossible to pick who is better than anyone else. 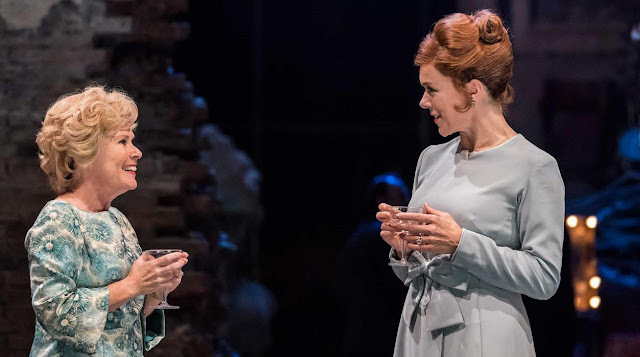 I was wowed by Di Botcher's performance of 'Broadway Baby' as much as I was gobsmacked by Tracie Bennett's 'I'm Still Here', as much as I was laughing my head off at Dee's 'Could I Leave You?' to how gutwrenched I felt watching Staunton's 'Losing My Mind'. This show is not only a love letter to Broadway, but this revival is a love letter to Sondheim thanks to the amazing performances on display here. The design of this revival is just as inviting as well; the entire show is set in the old theatre in which the group of women once performed as Follies girls, so while the building is essentially a lot of rubble, it has to be inviting enough to evoke a sense of homeliness and warmth in the audience's hearts and Vicki Mortimer executes that perfectly. Along with Paule Constable's amazing lighting design (as per usual), they manage to turn a lot of exposed brick, broken theatre seats and rubble into something that feels bizarrely inviting and nostalgic, despite those kind of things typically being uninviting. It's masterful work from the two of them and while I anticipated the show would feel lost in a theatre the size of the Olivier, Cooke's direction and Bill Deamer's choreography are so much larger than life that Mortimer's set pieces have to vanish completely at times to make room! 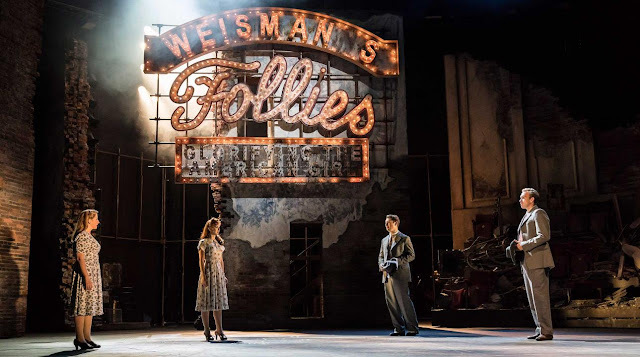 A good word also has to be put in about Jonathan Tunick and Josh Clayton's expert new orchestrations of the score, conducted by Nigel Lilley, which brought this show to life in delightfully new and rich ways. Is Follies at the National Theatre the revival of the year? Most definitely. Is it the best musical that London has seen in 2017? I'd go as far as to say yes to that as well. The show is essentially sold out, but I urge you to beg, borrow and steal your way into a ticket to see this production no matter what the cost may be before it closes its doors in January. It's a show that should not be missed, not only because it'll inspire you as a theatregoer, but equally because you don't want to miss out on this important moment in modern theatrical history. Follies runs at the National Theatre, Olivier through January 3rd. Tickets are available here, but they are majorly sold out, so keep your eyes open for returns and day seats. The show will be broadcast via NT Live on November 16th with more information on that here.